Ranikot Fort "(Great Wall of Pakistan)". Sindh (Sindhi: سنڌ‎) is one of the provinces of Pakistan. Sindh was home to one of the world's oldest civilizations, the Indus Valley Civilization which is 5,500 years old[source?]. 'Hind' is the corruption of the word for 'Sind'[source?]. 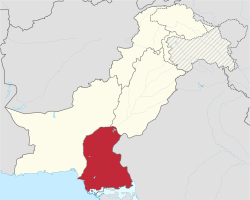 In 1947 Sindh joined Pakistan by a majority vote of members of the 1947 provincial legislature. ↑ "Sind - type and level of administrative division". World Gazetteer. Archived from the original on 2012-12-08. Retrieved 2009-08-19. This page was last changed on 13 March 2019, at 16:39.